This plug-in serves a fixed IP address (IPv4 and/or IPv6) to all DNS requests for host records (A/AAAA). This can be used as a simple way to host DNS records. WARNING: By default, this plug-in responds to ALL requests for A/AAAA records. It is therefore important to limit which DNS requests are processed using the settings in the "DNS Requests" tab. 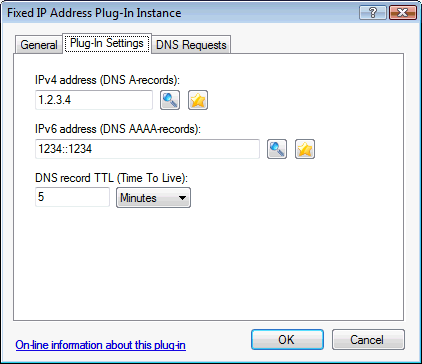 On the "Plug-In Settings" tab, enter the IP address(es) and TTL value to respond with.